← H. villosella Death – Tarantula Impaction? Jamie’s tarantulas which I am sure you know well. And finally tarantulascages.com. They all seem to be the same but I wonder which is more trustworthy. I don’t want the cage to break… I don’t want the cage to be dangerous for the T… It has to have a lock… and I would want one with ease of feeding and spot cleaning without having to bother the T. Jamie’s enclosures for juveniles confuse me because they seem to open from the bottom which worries me about an escape attempt. They also seem to be more for arboreal Ts than terrestrial juveniles. I also wonder your opinion on each of their adult T enclosures. I hope you shed some light on some of my confusion and take a look at the other sites and give your opinion? Finally as far as purchasing my T… I have been trying to decide between Jamie and swiftsinverts.com. I hear nothing but positive reviews about both. The packing of the T… judging from youtube videos… seem to be better from swifts. Only because you seem to have to hunt for the T in all that wrapping from Jamie. That worries me. Swifts seems like that packed in some sort of container and you lift the wrapping up like a top and there it is. I know this is alot of questions… but I am needing some direction because I want the T to have a great and reliable enclosure… and I want the T to be easy to unpack. I have been scouring the internet for comparisons and kind find any. Thank you and I hope to get a great informative answer soon. Hello! Are you in the US or in the UK? House of Spider is in the UK, so I’m not sure. I wasn’t sure if you were in the US and just looking to order enclosures from House of Spiders, or if you’re in the UK (which would mean you wouldn’t be able to order from Jamie’s and Swift’s. I have both a G. porteri (Chilean Rose) and a B. smithi (Mexican Red Knee), and I love both. You really can’t go wrong either way. If you’re looking for juveniles, a B. smithi will run you a bit more, but they also have long life expectancy and a beautiful coloration. Both have similar care requirements and are quite hardy in captivity. I have ordered the majority of my animals from Jamie, and she is by far my favorite dealer. That is not to say that other dealers aren’t equally fantastic. Kelley Swift has a stellar reputation, and I’m sure I’ll order from him eventually. I’ve just found Jamie’s communication, packing, and animal and shipping prices to be top notch. I also like that you can pick up your T, enclosure, and feeders all in the same place. It’s just SO convenient. I, personally, have never had trouble unpacking any of the Ts I’ve received from her. The $17 shipping with LAG is also a huge plus. I have six of Jamie’s juvenile enclosures, and I like them a lot. The lids are secure and can be easily maneuvered during cleaning to prevent escapes. They do not, however, lock. Are you worried about people getting in, or the animal getting out? I find them better for arid species (such as Rosies and Red Knees) as the large vent on the top allows for a lot of evaporation, which can make it more difficult to maintain humidity for species requiring moisture. What size juvenile were you looking for? That would also influence the size of the enclosure you would need to procure.If you were getting something 3″ or more, one of Jamie’s adult cages would also be a consideration. They are VERY well made, and have a hasp for locking. I have my adult G. porteri in one of these. I have only had one experience where I had difficulty getting the animal out of the packing vial, but that was not with Jamie. Usually, you just open the top of the vial or deli container, pull the paper towel “plug” that is covering the hole, then use a paintbrush to scoot the T out. For ones who don’t want to leave, I will pull the plug, lay the vial in the new enclosure, and wait for the animal to come out on its own (I’ve only had to do this a few times, and I had always worked so far). As for the packing of the spiders in the box, again, it’s never been an issue. I remove the packing materials and had no trouble locating the vials or deli cups with the Ts inside. You really can’t go wrong ordering from either Swift’s or Jamie’s, so that will come down to personal choice. Both are known for great service (and packing). If you want to pick up a T and enclosure at the same time, I would go with Jamie’s. If you have questions, she or Jon are always quick to answer them. Let me know about what size T you’re looking for, and I can better help you to narrow down enclosure options. Also, if you need help setting up the enclosure, just ask! What are the major negatives to housing slings in enclosures that are much larger than the typical ones people use? I have two, month old P. metallica slings for reference. The biggest negative is that it makes it more difficult for them to find prey. Out of all of the pokies I’ve raised, the metallica was the most skittish and the more tentative hunter. I’d be worried about it tucking itself in a corner and not finding the food. Larger enclosures also make it a bit more difficult for them to settle in. That said, what size is the sling and what size is the enclosure you’re planning to use? 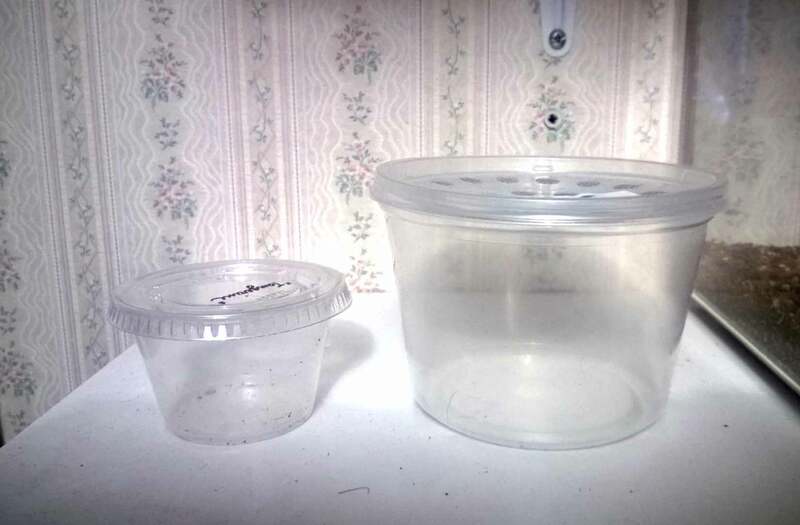 I usually only rehouse my pokies twice after they are slings, and give them slightly larger enclosures to give them some room to grow. Hello, I was wondering if you can teach me how to hold a trancula? I have a pet spider, and I’m afraid to hold her, she has thrown threats at me, so I need advice. I don’t make it a habit of holding mine, but here is a video that illustrates how to go about it. Personally, if she’s giving your threat poses, I would say that she’s telling you that she doesn’t want to be handled. Although a lot of people enjoy handling their Ts, they do not NEED to be handled, and many hobbyists have a hands-off policy with their pets. Although some will tolerate it, others can be unpredictable.